An ideal 2:1 ratio of omega 3 and 6 essential fatty acids, proven by research to benefit cardiovascular health, enhance stamina and energy, and improve general health and well-being. Certified Organic. Developed for people who want one product that gives them all of the good fats they need, without any of the bad fats they should avoid. Ingested in adequate amounts and in the optimal ratio, such as is found in Udo's 3• 6• 9 Oil Blend, EFAs have been shown to improve energy, stamina, performance sleeping patterns, concentration, mood and skin appearance. Most people think that avoiding all fat is the path to true health, but in reality there are two substances that can only be found in fat that are just as necessary to our survival as proteins, carbohydrates, vitamins and minerals. Of the many kinds of fats, only the ones called Omega 3 and 6 have been designated as essential fatty acids (EFAs) by scientists, because every living cell in the body needs these fats, but the body can't make them on its own. A direct food source is always required. The key to health from fats lies in ingesting the essential ones in the proper ratio. This isn't usually achieved as it has been shown that the average diet is far too high in omega 6 and dangerously low in omega 3. Another concern we face when choosing a source of EFAs is that the majority of oils found on grocery store shelves have been damaged by heat, light and oxygen and modern processing practices. 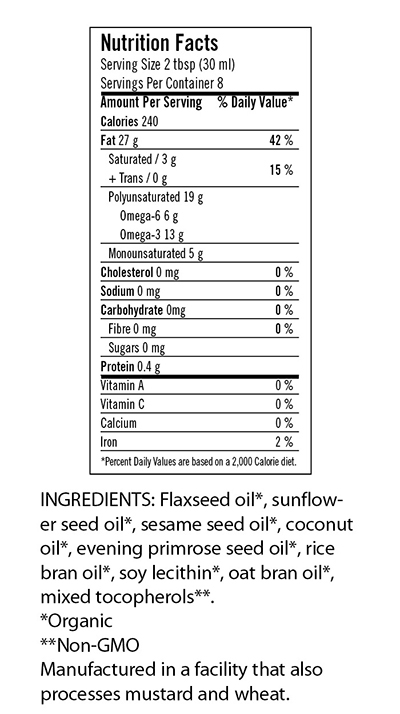 These oils may no longer provide healthful EFAs and may even be harmful. Udo's 3•6•9 Oil Blend is a special blend of carefully chosen, natural, unrefined, EFA-rich oils that has a pleasant, nutty, buttery taste. It contains oils from fresh, certified organic flax, sesame, sunflower and evening primrose seeds as well as oils from rice and oat germ, providing 'minor' ingredients with major health benefits. This oil blend has added non-GMO soy lecithin, which improves oil digestion and provides the building materials for healthy cell membranes. Udo's 3•6•9 Oil Blend also contains medium chain triglycerides, which are easy to digest and assimilate and can be used directly by our cells as a source of energy without increasing fat deposits. 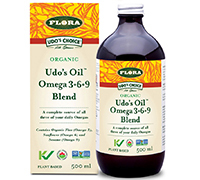 Udo's 3•6•9 Oil Blend is pressed and filtered in a state-of-the-art, low heat, light and oxygen-free environment to maximize stability and provide nutritional value and freshness. Nitrogen purged, amber glass bottles are filled with the oil blend and then nitrogen flushed to eliminate oxygen. The bottles are then capped and packed in a box to further protect the ingredients and ensure the highest possible quality. It is kept refrigerated in storage and ice packed when in transit when the weather dictates to keep the heat sensitive EFAs fresh. Start with one tbsp per day and gradually increase to one tbsp for every 50 pounds of body weight per day. Udo's 3•6•9 Oil Blend is compatible with all foods and can be used with cold, warm and hot foods (once off the heat source), but must not be used for frying, baking or other high temperature cooking. Favourite uses are in fruit or vegetable salads, protein shakes, yogurt, apple sauce and juices. Try it on steamed vegetables, rice and pastas and baked or mashed potatoes or add it to homemade soup (after cooking). Mix it with extra virgin olive oil in dishes such as hummus and tabouleh or serve with balsamic vinegar for dipping. Add to fresh vegetable juices along with Udo's Choice Beyond Greens, or Udo's Choice Wholesome Fast Food Blend, for a nutritious meal replacement. Unopened bottles can be kept refrigerated for up to months and for over two years in the freezer (oil shrinks when frozen; the glass bottle will not break). Once opened, use within 4–6 weeks and keep refrigerated between uses.